Michael McFadyen's Scuba Diving - Blue Corner The nation of Palau is located 960 kilometres to the east of the Philippines and about 7 degrees north of the equator. About an hour's run from the main town are the best dive sites which include Blue Holes and Blue Corner. So, you might ask "What is the diving like?". From the small number of sites that I sampled I must say that the sites are good. Nearly all dives are drift dives and this provides a bit of an new experience for most Australian divers. The Blue Holes and Blue Corner are located next to each other, so close that if you dive the Holes you can end up diving the Corner as well. At Blue Corner, after leaving your boat you drop straight to the top of the reef and proceed down the side of the wall. The current already has you in its control. The coral life along the nearby wall is not overly spectacular, but it is quite pleasant. However, the wall itself is quite something, dropping over 300 metres to the bottom. There are large numbers of barracudas (see photo), surgeon fish, snapper and jacks (kingfish) off the wall. 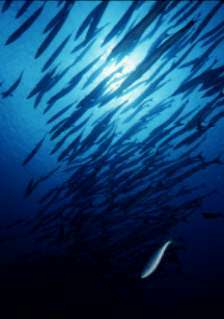 The barracudas school in the area and their feeding can be quite dramatic to watch, especially if they are among sharks. The water temperature was 29°C in November and the visibility was in excess of 30 metres. In summary, Belau diving is not for everyone, but it would be excellent for a better off diver with a non-diving spouse and/or children. Both the Resort and the dive operation are of a world class standard but, although I thoroughly enjoyed my stay and the diving, in my opinion it is a bit too far from Australia to justify the expense and time of diving a coral reef. Michael McFadyen travelled to Belau courtesy of Dive Adventures (61 2 9299 4633), Continental Airlines, Air Micronesia, Palau Pacific Resort and Splash.